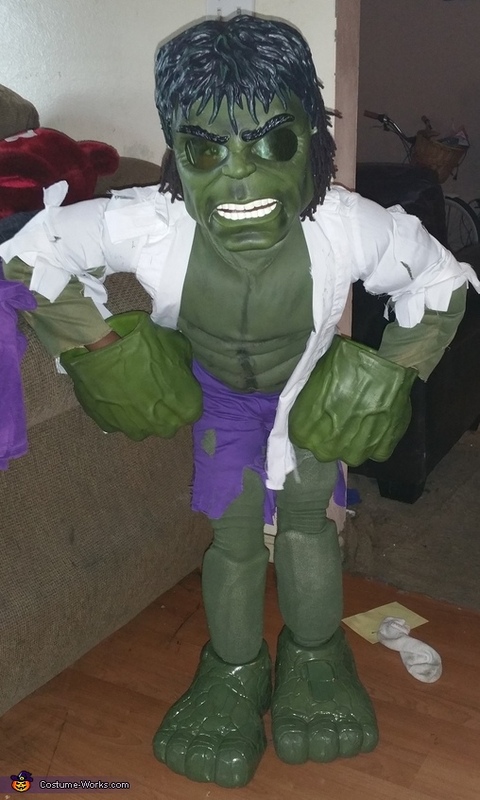 My 5 year old son Ronbie wanted to be Hulk. But he was clear that he did not want to be the store-bought variety Hulk. So I took to creating something unique and hand-made. The mask and gloves were given to Ronbie 2 years ago as a Christmas gift. I bought the buff body suit from party city for $12 and the stocking from Target for $4. The shorts,white collar shirt, and turtleneck are from the thrift store and costed a total of $3 The feet were purchased at a garage sale for $2. I then purchased 3 cans of olive green spray paint from Micheal's Art And Crafts and then sprayed the turtleneck shirt, stockings, bodysuit and feet. We then applied black makeup to the bodysuit to highlight the muscles of the chest. The collar shirt and shorts were cut and torn by Ronbie to create the David Banner and Hulk transformation. I also removed Styrofoam from an old life vest to create the muscles of the legs and thighs. The two us had a great time making this costume.